When I decided to “trade up” in motorcycles in April 2010 I had no idea what I was getting myself into. Without this foresight, I plunged myself into buying a 1986 Kawasaki Concours (a “connie”). In my mind, I considered this a great upgrade. I had been riding a 1982 Honda Hawk 450, which had served me well after I did the initial work on it, but my riding had gotten beyond the point in which it had enough power or load capacity for me to continue our relationship. Given the excellent timing of selling my truck and already lining up a buyer for the Hawk via a co-worker, I felt it was time to do the upgrade. The 1000cc Concours tempted me greatly, though I also considered other larger sport-touring type bikes in the process. All my leads failed until I found this one, for a reasonable price and local. After a bit too much runaround from the seller in trying to actually hunt him and the bike down, I finally bought it for what I thought was a good deal. I got it home and then within a week had sold the Hawk and took the Connie on a trip of several hundred miles. The bike behaved ok, but I felt there were some root issues. Upon getting back home, hooking up with the Concours mail list and doing some research, I discovered that someone had put a bias rear tire on the front of the bike, with a radial rear on the rear. No wonder the head shook so much. This led to the first repair: two tires replaced. Spendy, but doable. I rode for a month or so, but then the battery died off. So I had to replace that too. Then a fuel leak started, and I discovered that it leaked whenever the gas was left in “PRI” or prime. Hrm. Apparently the carbs would eventually need work. The final straw was in the fall/winter of 2010, where it started producing a lot of steam, especially on warm-ups. I tightened hoses and it went away, but only for a week or so, then it returned with a vengeance. Also, in early 2011 the forks started leaving literal puddles on the floor, not good. By the spring of 2011, I realized most of the prior year’s riding had been my first ride in April. With a block of time off coming up in the summer of 2011 I hoped to ride it a bunch. I made plans to make the bike reliable and ordered up: steel braided brake lines for front and rear, fork rebuild kit, new grips, and a coolant hose set. I thought this would put an end to all the little niggles left on the bike and I could get on with riding. When I cracked into the bike at the turn of July when the parts arrived, I was dismayed. I discovered that the water pump was also failing. This has been ordered and is where we stand today, waiting for the elusive part. All in pieces like the picture below. I have to wonder, is it really worth it buying a used motorcycle of unknown origin. Did the seller know there were a lot of little fixes that had to be done on the bike just due to it’s age and level of neglect? I will never know, but I am determined to fix it all and make it once again a stable steed in my garage, just like the Hawk which I miss so much right about now. 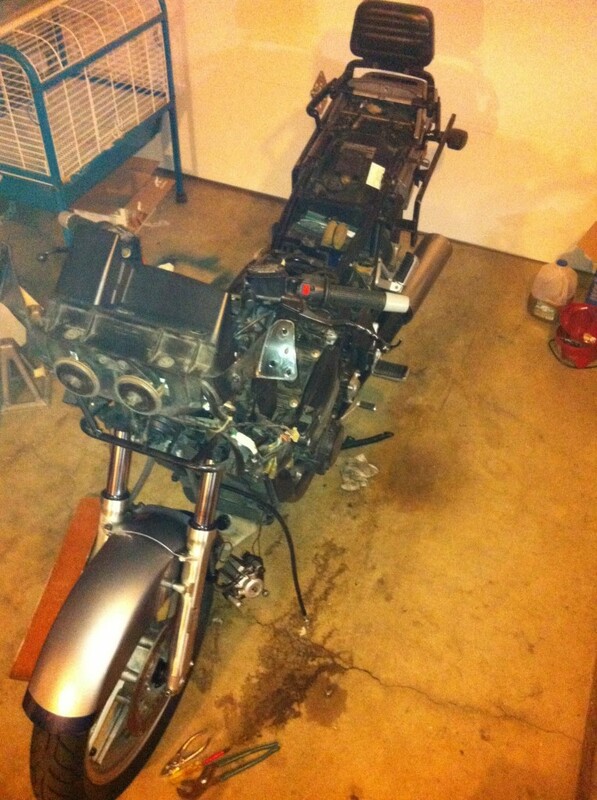 This entry was posted in Motorcyling and tagged Concours, Kawasaki, used bike, ZG1000. Bookmark the permalink.